A ruptured cerebral aneurysm leads to death more than one third of the time. That makes identifying people who may suffer a rupture a key to extending their lives. New research has identified new tools for screening people who may be at increased risk. 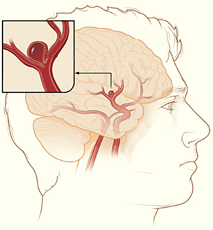 The arteries of the brain sometimes develop tiny bulges, called cerebral aneurysms. Most of the time, these bulges are harmless. Only when a bulge breaks are there severe problems. The ruptured aneurysm floods the brain with blood and deprives the brain tissue normally served by that artery of nourishment. This type of stroke can be debilitating or even deadly. Researchers from the Department of Neurosurgery and Institute of Forensic Medicine Heinrich-Heine University Institute for Physiological Chemistry and Pathobiochemistry, Westfalian Wilhelms-University; Department of Neurology, Mayo Clinic; Department of Epidemiology, University of Iowa; Division of Neurosurgery, St. Michael's Hospital; Keenan Research Centre for Biomedical Science and the Li Ka Shing Knowledge Institute of St. Michael's Hospital; and the Department of Surgery,University of Toronto and the Lawrence Livermore National Laboratory all worked together to study the underlying physiology of aneurysms. The research discovered that the tissues that make up cerebral aneurysms are constantly changing and reforming. As published in the journal Stroke, they found that the collagen that forms these arterial bulges is much younger in people prone to ruptured aneurysms than collagen in people with no risk factors. This discovery is not ready to deploy into hospitals and doctors' offices. More research is needed, but this does offer a bit of hope for the two or three percent of us who are walking around with a potential life-threatening cerebral aneurysm hiding in wait.